But, if this is the secret for the rest of us to get it HEY...sign me up. I use unrefined/unfiltered/cold pressed coconut oil and grape seed oil immediately after showering rather than lotions for their antioxidant and skin renewing effects (alternating not together). LOVE them. (great for cooking as well. 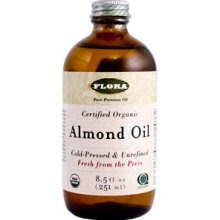 Almond oil sounds like a great choice also. Ill try it.